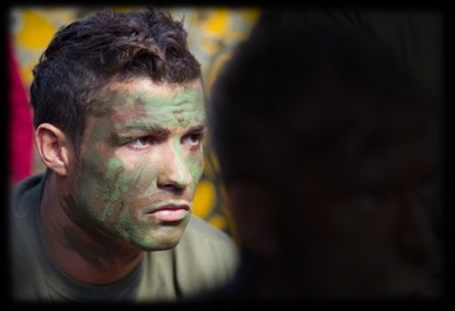 27.01.2011 » Ronaldo: "They can keep painting their faces. It just motivate us"
Cristiano Ronaldo says that Sevilla players should keep painting their faces, because that motivates Real Madrid players even more. He also added that if they play against Barcelona in the final, they won't see that game as a revenge opportunity. Cristiano Ronaldo talked about the controversial motivation video that was published by Sevilla's marketing department, in order to promote the match against Real Madrid. Ronaldo said: "Sevilla players should keep painting their faces, because that sort of things motivates us". Cristiano also gave his thoughts on the match: "We could have scored another goal, but it's fine like this. Now we'll play in the Bernabéu and Sevilla can keep doing those things as painting their faces in videos, because that motivates us a lot." In the other hand, Cristiano Ronaldo predicted that the final of the Copa del Rey will be decided between Real Madrid and Barcelona, since he considers that both teams will get through the semi-finals. "The final should be played by the two best teams in Spain, but it won't be a revenge for us." Ronaldo also said he didn't like the referee's performance last night and added that he didn't see the incident with Casillas, close to the end of the match (Casillas got hit by a bottle, that was thrown by someone in the public). About the newcomer Emmanuel Adebayor, Cristiano Ronaldo praised his new teammate: "He's a very good player!". Real Madrid will play against Osasuna this Sunday and you can follow this game through livestreams and livescores, here on ronaldo7.net.